Nothing says summer better than a good ol' BBQ! Cleaning your charcoal grill is a necessary yet tedious task. Keeping your grill clean will extend it's life. This is a guide about cleaning a charcoal grill. After my charcoal grill top has cooled from grilling, I spray it down with oven cleaner and place inside a garbage bag and tie shut. I let it sit over night. When I remove it, I give it a quick and easy scrubbing with dish detergent and water. It cleans up so nice and easy! Rinse well, let dry, then spray it down with cooking spray and place it back on the grill. The cooking spray also prevents rusting in humid conditions. Now I can enjoy my cookouts without the hassle of clean up! Clean the grill by spraying white vinegar over wadded up tin foil and scrubbing with it. Could someone please help me find a way to clean off the grilled-on grease that coats the inside of my propane barbecue grill? I believe the body is aluminum. Currently, I am using a strong solution of Boraxo and washing soda. This cuts the grime, but I'm having to baby it along and it takes quite a while. At least, this mixture does not bother the paint. Is there a cleaning product or recipe that you have used and it came out the way you liked? Please let us know. Thank you. Do you want to just clean the grill? have done this, can't remember whether or not it worked well, I think it did. Thanks for your ideas. I will go at it again today. Will try the oven cleaner. Well, I can't wait to get that grill going. 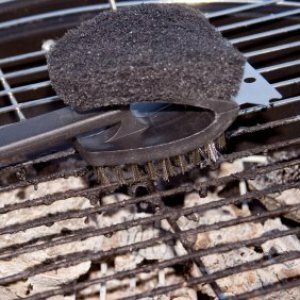 Tips for cleaning a Barbeque grill. Post your ideas. Hate To Clean That Expensive Gas BBQ Grill? Take the grates off and run in the dishwasher on hot wash and dry, remove as soon as the dishwasher is done. They will still be hot, use a pot holder to remove. There will still be some stuck on drippings, minus the grease. Proceed to finish the cleaning in your sink. You'd be amazed on how easy they will be to clean. I have a Weber charcoal grill. When I start a new cooking session, the flames will "burn" any stuck on particles and then I scrub with a "grill brush".